The Seekers I: Valley of Kings - featuring Team SPG Team Seek Power Gaming is poised to capture several top spots in both the Eternal Tournament Series and the Eternal Community League. BruisedByGod is in second place for 2018 Series Points** in the Eternal Tournament Series, with SecondBlue not far behind. (SPG teammate ChildRoland is holding the top spot). SooNo is current frontrunner for the Eternal Community League’s inaugural season. All three of the players interviewed here can be found in the Top 15 of both leagues. Seek Power Gaming appears to be currently dominating the ranks in both the ETS and the ECL. How much of this would you say is due to the strength of the individual players compared to working together as a team? We’re all strong players as stand alones, which is a big part of us being asked to join SPG in the first place. But as far as success after joining SPG, it is all due to the team. I would say that the strength of any player is incredibly dependent on who they are playing with and who they are talking to. It is more or less impossible to separate the two. Even if I am coming up with a deck and playing it by myself, the player I am is still in part a result of my teammates. Joking aside, being on a team increases the strength of the individual players. We compete against other teams and players - but most importantly against each other. This certainly motivates me to bring decks that I feel will be able to compete with my teammates for bragging rights among ourselves. BruisedByGod and I have been a duo on: deck building, theory crafting, tuning, testing and really everything that pertains to Eternal. Although he likes to throw me on ladder and perch while I lose with some nonsense he’s constructed. Hahaha. 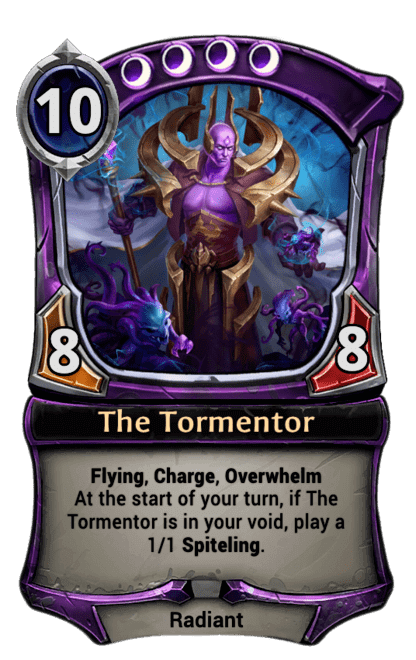 Let's take a closer look at some of that nonsense, and then talk some more about what it means to be a team player in Eternal. SooNo took third place at a recent ECL tournament with this Xenan list that he dubbed Taharqa Mid. BruisedByGod also finished in the Top 8 in the same event with a nearly identical deck. What was the original inspiration for this brew? I made it because I like messing around with Mask of Torment and Hall of Lost Kings. This deck can do some nasty things, if it can hold off early pressure and you keep your life total up. BruisedByGod has a soft spot for Mask of Torment. 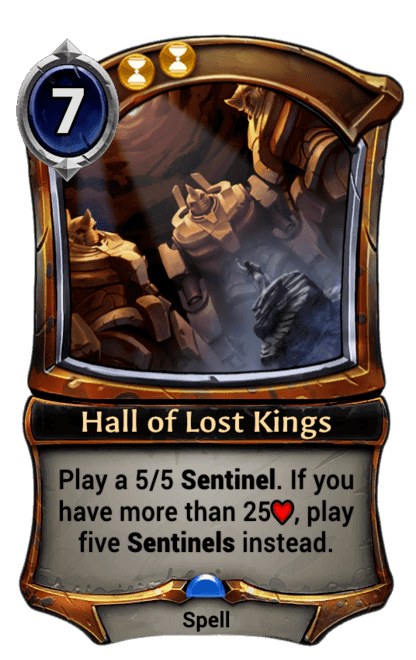 I have a soft spot for Hall of Lost Kings. And we like to tilt SecondBlue by NOT playing Auric Interrogator or Xenan Obelisk hahaha. Killer recursion is a hell of a drug. Was this list constructed specifically as a tournament deck or for other purposes? It was made mostly as a meme deck. But this event was sort of a test to see if it could go beyond that. Because I have played Hall of Lost Kings at a high level before. Turn 6 Hall of Lost Kings is no joke. And with some new cards in this expansion, I thought I could maybe take it the next level. I knew from SooNo's performance that Hall of Lost Kings could have success at the highest levels of competitive play. SooNo, what contributed to your decision to make these modifications? Well I added an Annihilate for the reason there’s this card that enjoys teaching people. And i just didn’t want to be learning from her. There is a nice balance between Power sources (22 each of and ). 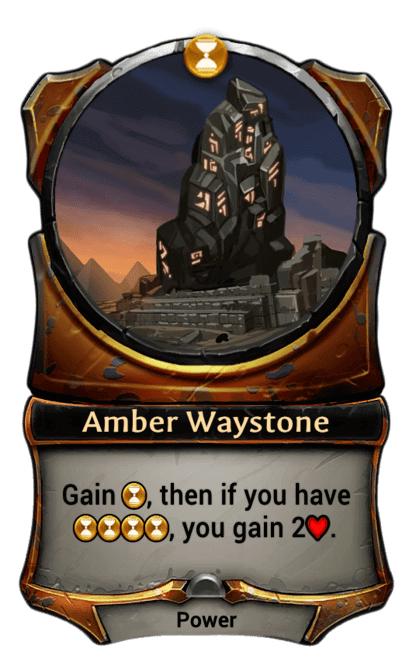 The Vara’s Favors even out the Amber Waystones. And both make a lot of sense in a deck that includes Beckoning Lumen and Hall of the Lost Kings. It's funny, I did the same thing to another one of BruisedByGod’s Xenan decks which I won with. And he had to point it out to me as you did. Because when I looked at the deck, it just felt correct in my gut pertaining to changes I made. And the fact they’re evenly split is just a coincidence. It is also Interesting to note that in a "health matters" deck there is only one copy of Katra, the Devoted (in the Market). Not including more copies of Katra in the main deck is an unexpected choice (though it seems to have paid off). What was the thinking there? Katra is just a "better" Xenan Obelisk in this deck, or at least we hoped haha. Katra is a better version of Obelisk if you can get her down and protect her. But she is very dead when you are under a lot of pressure and don't have any ways to pump her on the board. The reason to only have one is so that she will not be dead when you draw multiples of her without activators. But you keep the explosive potential of Katra by having one in the market, when you have the game state that allows room for her to be played. And in those situations she is unmatched. It is refreshing to see a successful Xenan list that is different from most of the others we've seen recently. Do you intend to continue playing and refining this deck going forward? As far as improving this deck, I feel only new cards, buffs or nerfs can do that. But BruisedByGod and I have done well with Xenan lists that are not Killers before. We’ll do it again, you’ll just have to wait and see haha. Yes. I have hope that one day two color Mask of Torment will be a Tier 1 deck. But I do not see it working as a top deck with the current card pool. Several of SPG's players are participating in both of Eternal's weekly competitive leagues. That can be a demanding schedule - potentially up to four days a week. What motivates or inspires you to participate? I participate in whatever I can. I come from a Magic, the Gathering background. I’m used to playing in events six nights a week, and the seventh it was team drafting. So ETS and ECL have filled a little bit of my competitive itch. But I got a whole lot more that needs scratched haha. I enjoy the game and in particular playing tournaments alongside my teammates. The discord calls make putting in the time worth it. Other than that, I like winning especially when I can do it my own way. Personally I can't attend as many tournaments as I would like to due to a need to study. However the tournaments I do attend are heavily prepared for. And I am motivated by a fear of failure. As a team we generally demand attendance, so it's quite expected to attend tournaments of importance for most of SPG. How much preparation or practicing do you do as a team, as opposed to just showing up to participate in an event? We do a lot of in team practice, brainstorm meetings, daily chit chat among us. And any help someone needs or wants, we make sure to be there for them. As I said before, we’re strong stand alone players. But when we work together, we go from strong players to one of the top teams in the game. Team work makes the dream work. It sounds like a daily effort for you guys. That must require a lot of communication. How do team members consult with each other about what decks they are working on, or what they will be bringing to a tournament? We have a discord tab where we share lists among team members. What might be unique about this channel is how frequently lists are posted and updated. We are always consulting each other on what to bring, how an event may look, and what this means for what we need to do. Or what new deck if any people want to try. There’s a lot. We do a lot as a team. Getting as many people on the team to play a deck you want help with is definitely a great way to get multiple viewpoints and suggestions on how to improve the deck. That’s the whole point of being on a team in the first place. You can join a team, say nothing, present nothing, test with noone, and do your own thing. But at that point you’re not on a team. And I’d be willing to bet you wouldn’t survive the long run alone. If there is a specific archetype that I know a teammate is familiar with then I will @ them in the deck post to get their attention and feedback. People will post concepts and then others will play them. And help to fine tune lists. The activity in that channel is really the heart of SPG. I think its more like the arms or legs. [Laughter] The players are the heart of SPG, and the bond that we share. Thanks for your time guys. It is really interesting to hear about what happens behind-the-scenes on a competitive Eternal team. And I look forward to talking again soon. Before we wrap up, I'd like to also acknowledge your teammates TonyGeee and Paradox. They were both valuable consultants and supporters during the development of the Eternal Power Calculator. Good luck to everyone as we enter the final rounds of the Eternal Tournament Sseries 2018 Season Three and the first-ever season for the Eternal Community Leauge. Check this space for the second part in our series with Seek Power Gaming, coming soon. Follow Shiftstoned on twitter for the latest announcements.